I'm pleased to announce, that the experimental version of Open Croquet for Squeak (https://blog.krestianstvo.org/en/open-croquet-for-squeak-6/) is now updated to the recent Squeak 5.2 (32bit). This update includes critical FIX for the Croquet's IslandReader, which is related to the new Squeak image segment loader code. The included Croquet demos have become usable in network scenarios, but with some requirements: For replication to work, a participant must run a Master of the selected demo at least once on its image (for example doing: CroquetMaster new openInWorld). Then that participant could connect to any running Master on a network (for example doing: CroquetParticipant new openInWorld). In the future updates this will be fixed. Don't forget to download and extract 'Only content' package to /Contents/Resources/ folder. Here is the screenshot of one Master (on macOS) and two Participants (on Windows and macOS) collaborating together. > I'm pleased to announce, that the experimental version of Open Croquet for Squeak (https://blog.krestianstvo.org/en/open-croquet-for-squeak-6/) is now updated to the recent Squeak 5.2 (32bit). > This update includes critical FIX for the Croquet's IslandReader, which is related to the new Squeak image segment loader code. 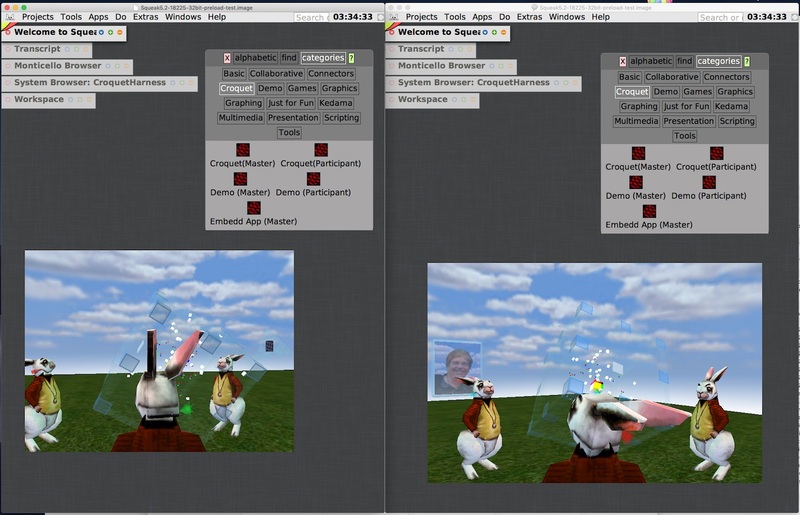 > The included Croquet demos have become usable in network scenarios, but with some requirements: For replication to work, a participant must run a Master of the selected demo at least once on its image (for example doing: CroquetMaster new openInWorld). Then that participant could connect to any running Master on a network (for example doing: CroquetParticipant new openInWorld). In the future updates this will be fixed. > (Installer fromUrl: 'http://sdk.krestianstvo.org/sdk/croquet/croquet-sn.3.mcm') install. > Don't forget to download and extract 'Only content' package to /Contents/Resources/ folder. > Here is the screenshot of one Master (on macOS) and two Participants (on Windows and macOS) collaborating together. One of Squeak's coolest projects ever, thanks Nikolay! One question, sorry I didn't try but will it work in 64-bit Squeak and, if not, why not and when will it? Can you explain what the bug was, and what is the fix? I am very inspired by the new Squeak 5.2 VM and its amazing speed! Just dreaming of having Open Croquet working on it. And now after first early steps of porting from Squeak 4.x, even without formal tests, it is seen how much faster Open Croquet demos are working. Actually, this fix is in adapting the IslandReader segment loading methods to the new behaviour of '#primitiveLoadSegmentFrom: segmentWordArray outPointers: outPointerArray': "Upon successful completion, the wordArray will have been becomed into anArray of the loaded objects." In original Open Croquet for Squeak 4.x, 'IslandReader>>#loadSegmentFromData: segmentWordArray outPointers: outPointerArray' traversing the loaded WordArrayForSegment with #nextObject for post-sending startUp message to objects ('#startUpInIslandReader: reader'). But, in Squeak 5.2 it should uses an array of the loaded objects, instead WordArrayForSegment object. That's it. Trying this out on a Raspberry Pi (obviously). has a #'' (apparently a ByteSymbol with just char value 0 in it) at the end of the method ; which of course a BlockClosure does not understand. "This method was automatically generated." The" module: '#openGLLibraryName'>" looks a bit odd to me... shouldn't that have been recompiled to use the real library name? I just have updated Open Croquet integration with support of SmallFloat64 class, which is used by default on 64 bit Squeak. I have tested this on Windows'10 with http://files.squeak.org/5.2/Squeak5.2-18225-64bit/Squeak5.2-18225-64bit-201810190412-Windows.zip and Croquet works. Don't forget to enable B3DXUsesOpenGL=1 in Squeak.ini for OpenGL. or do (Installer fromUrl: 'http://sdk.krestianstvo.org/sdk/croquet/croquet-sn.4.mcm') install. As for macOS, there is seems to be a problem with the B3DAcceleratorPlugin for 64 bit, which constantly craches the VM. May be somebody had a success of running B3DAcceleratorPlugin with OpenGL on 64 bit Squeak for macOS? Ah, that's *great* to hear! Any quantitive info appreciated when you have it. For example, knowing what's happened to frame rates would be good. But more interesting, and perhaps more difficult, is discovering precisely what activities in Open Croquet are affected and by how much. Ah, good; that makes perfect sense. Thanks! Yes, but it doesn't change the source code. Follow the senders of openGLLibraryName to see the magic. > Trying this out on a Raspberry Pi (obviously). which got a bit further. > has a #'' (apparently a ByteSymbol with just char value 0 in it) at the end of the method ; which of course a BlockClosure does not understand. > The" module: '#openGLLibraryName'>" looks a bit odd to me... shouldn't that have been recompiled to use the real library name? > Yes, but it doesn't change the source code. Follow the senders of openGLLibraryName to see the magic. Which doesn't seem right. Should it also use the #openGLLibraryName thing? I'd love to see this working on a Pi but I'm going to need help with anything to do with making the opengl trickery work. OK, so it's supposed to send #openGLLibraryName at some startup point. Very clever. Yep, in OpenGL>>initialize it calls "self privateInstallLibrary: self openGLLibraryName." which patches the library name into all compiled FFI methods. Ah, that seems to be an actual bug. #privateInstallLibrary: does not go into the subclasses. In OGLWin32, that method has the correct 'opengl32.dll' module. OGLMacOSX uses a different mechanism entirely. And OGLUnix relies on "GL" linking to the right thing. So I'd say in privateInstallLibrary: we need to patch both OpenGL and OGLUnix. I attached the source code and necessary texture images.